Love these shorts, got them in H&M few weeks ago... good amount of rips done in the right way ( know what I mean, sometimes they just don't rip the denim in the right way??) and love that they are a slight dip dye of denim into pink. Dip dye denim ripped shorts: H&M. 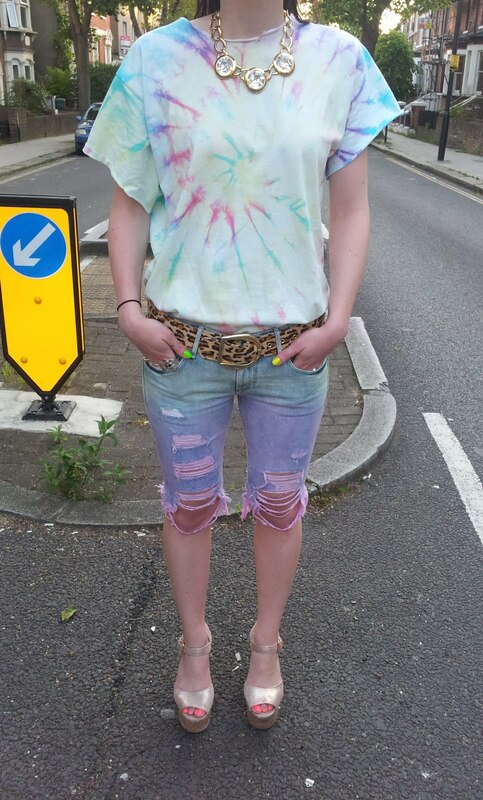 Tie Dye T shirt: Ebay. Leopard belt: Beyond Retro. Pink metallic platforms: Topshop. Faux diamond necklace: Susan Caplan Vintage. Skull ring: Market in New York.